hands, while a curly-haired woman comforted him. "Don’t worry. It’ll be all right." "Almost five minutes. That’s like five months in the real world." something for me, because I usually have my face in a book." Facebook at least eight times each day — and more times at night. and should never be outsourced." five or six friends, but on Facebook, I have 674. I’m even friends with Juan Carlos Montoya." "I don’t know, but he’s got 4,000 friends, so he must be famous." "No, Mafia Wars. I’m a Hitman. No one messes with Edna." "Wouldn’t you rather meet some of your friends in person?" I’m pretty certain, during the Eisenhower Administration. " "No, to take a pic of one of the young ladies there. That’s what I’m using." "Didn’t your friends notice that you look different?" "Some of them did, but I just told them I’ve been doing lots of yoga." days ago. Just thought you should know.’"
Google woke up to the Facebook and the Twitter challenge. Finally. Google Buzz is the latest product from the Google family and its best attempt to build a social network after the early attempts like Orkut and Open Social saw marginal success. To me Google Buzz looks like FriendFeed 2.0 (Facebook acquired FriendFeed last year) with its stream of updates, pictures, links from one’s friends. 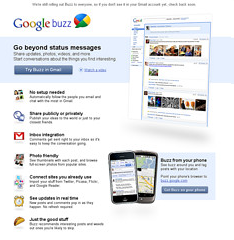 The biggest advantage that Google has in launching Buzz is that this is built into the Gmail application which already has over 175 million users. And Buzz is available on the iPhone and the Android as well. Google is giving a lot of granular controls but the default social graph is based on the Gmail settings (mail recipients and senders of mail). Whether they indeed are actually the desired social graph for someone is something that I am not sure. For me, it surely is not! Will Google win against Twitter with the Buzz? Twitter is simple and the tweets go to all the people who follow the tweet sender. “Buzzing” is not. There is a public and private buzz and this could make it complicated. The key challenge is how will Google square off against Facebook when Facebook introduces email. And whether Google Buzz will integrate with Facebook connect. That will be interesting to watch! I thought that I had analyzed the levels and degrees of competition fairly comprehensively. In fact, I have used that as an organizing framework to understand competitive advantage. Recently a friend of mine sent me an excerpts of an interview with Bill Gates when he was still the CEO of Microsoft which makes interesting reading. Getting the brightest bulbs to work at Microsoft has always been his obsession. It’s paid off. But what about now? The best and the brightest want to work for companies like Google and Facebook. Microsoft seems to be losing the talent war. And does that explain why Microsoft has not made any ground shifting move in recent years yielding that terrain to Google and others? Microsoft is caught in a classic dilemma of its own making. Its major revenue and profit streams continue to be Windows and Office which needs to be defended at all costs against young new attackers. Now will the smartest guys want to work for a organization where they would have to defend legacy or want to take a crack at changing the world? Unless you are a Singapore government scholar who has no choice but to work in the Singapore civil service because of the scholarship bond that you sign when you are 18 years old.